With a great team of DZ staff, good facilities, a Twin Otter and the super fast Beech 99, the Empuriabrava Easter Boogie is the ideal location to kick start the jumping season after the winter break. With Easter being three weeks later than 2005 we were hoping for some warmer weather. We were not disappointed! Five of us flew out from Bournmouth, and after a short drive from Girona airport, we met up in the Orange Kiwi bar on Thursday night. A number of others had already been out here a few days so we caught up with what they’d been up to over some much needed food and a few beers. Whether you wanted an early start to make the most of the good jumping weather or needed some time to recover by getting to the DZ later in the morning, there were DZ staff keen to get you in the air when you arrived. The DZ bar starts to come alive from about 8am, time for some coffee and breakfast before meeting up at 8.30 for a dirt dive and wheels off at 9am. There were two main FS groups load organised by Caroline Hughes and Regan Tetlow. The first jump of the day was normally an 8-10 way group, this soon increased by the second lift as more people arrived. By the end of the day both load organised groups would be joined together again for a fun 20 way. Load organising services were provided free and there was also free camera with every jump. Each dive was debriefed and advice was given to progress the skills of individuals and the group as a whole. Having a camera also means you get your good and sometimes not so good moves shown in the DZ bar at the end of the day, and there’s nothing quite like the back drop of Empuriabrava and its coast line for some great camera shots of your formations. 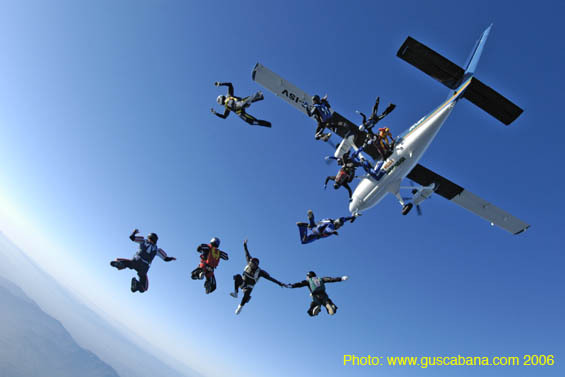 The load organisers worked very hard to create interesting and challenging dives, got you in the air as much as you wanted and ensured everyone was getting the most from each jump. Empuriabrava caters for most tastes and you can easily eat out at a different place and have different types of food every evening. After food, we would all meet up at the Orange Kiwi for a few beers (or lots of beers)! before turning in and thinking about the next challenge of getting up for the first lift of the day. The Jumping day ends when it gets dark and over the 4 days of the Boogie our group got 24 jumps. The boogie itself managed a staggering x jumps over the period! I know our group had a fantastic time and the load organising will definitely bring me back to Empuriabrava again and again. Thank you to manifest and everyone else who worked hard to make it a great Easter holiday! About a 100 people from all over Europe registered in this edition of the Go Vertical, with Tim Porter as organiser. Also, that was the first time Babylon held a workshop to improve flying skills in a boogie. Familiar faces from England, Holland and Italy attended, all of them coached by Kury and Nimmo. All, participants and coaches look forward to repeat the experience again, hopefully, with new faces.